That frock … oh, that frock! Truly deserving of a post all of her own, she is reverently referred to by me as “The Ava” and she makes my little heart flutter! Sadly, The Ava doesn’t even belong to me – if she did, she’d hold prime position in my wardrobe – in fact, I’d probably purchase a mannequin and display her in my bedroom. The Ava is in fact, a “hire frock” at the Hamilton Operatic Society’s garment hire facility. As such, she spends the majority of her life squeezed into the rack of frocks under the “50’s category.” Funnily enough however, The Ava is not even a vintage 50’s frock, she’s an 80’s reproduction of a vintage 50’s frock; but that doesn’t make me love her any the less! Having been around for over 30 years, and being the style she is, I like to believe The Ava has enjoyed quite a fancy and refined lifestyle. I’ve worn her on two occasions – once for a photo shoot at Pukemiro and secondly for a calendar shoot – each time she made me feel like a princess. The funny thing about The Ava is that she’s really not even that flattering on me; her ruching doesn’t flatter my waist, and her cut doesn’t flatter my bust. But it doesn’t seem to matter – I still love everything about her. If asked to explain what it is about The Ava I love so much, I think I’d have to say her allure lies in the combination of her fabric (a gorgeous black chiffon-like material with a large silvery-white check running through it) and the fullness of her skirt, which is where the princess feeling comes in. I think too, that the magic intrinsic in The Ava for me, can also be attributed to the fact that each time I’ve worn her, it’s been for an exciting occasion. The photo shoot at Pukemiro was the first one I ever did; I was petrified, and it was one of the most awesome days I’ve had in a long time! The second time was for a Pinup Calendar (see Miss March above) and that too, was a fabulous day spent with some awesome and creative women. Another photo at Pukemiro – this time by Spark Photography! 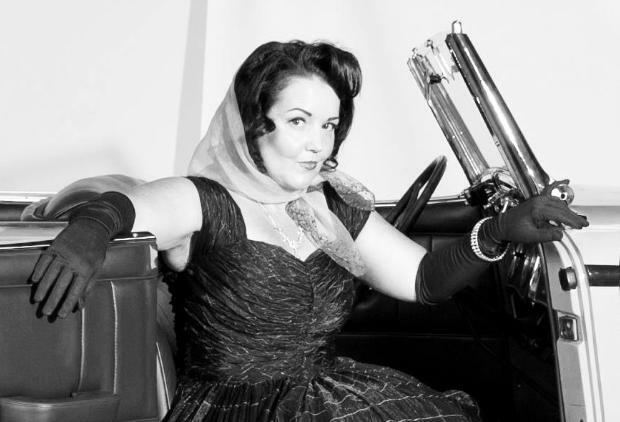 So if you’re ever at the Hamilton Operatic Society, pop over to the 50’s category and admire her … and if you do get an opportunity to bedeck yourself in The Ava, please be careful – she’s my favourite 50/80’s girl! 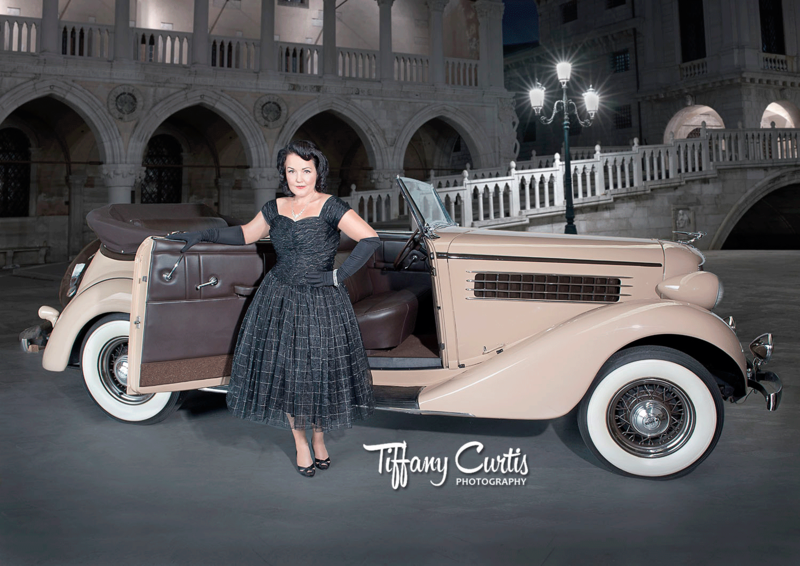 Photo by Tiffany Curtis Photography – this is a cropped version of the original, but approved by Tiffany! 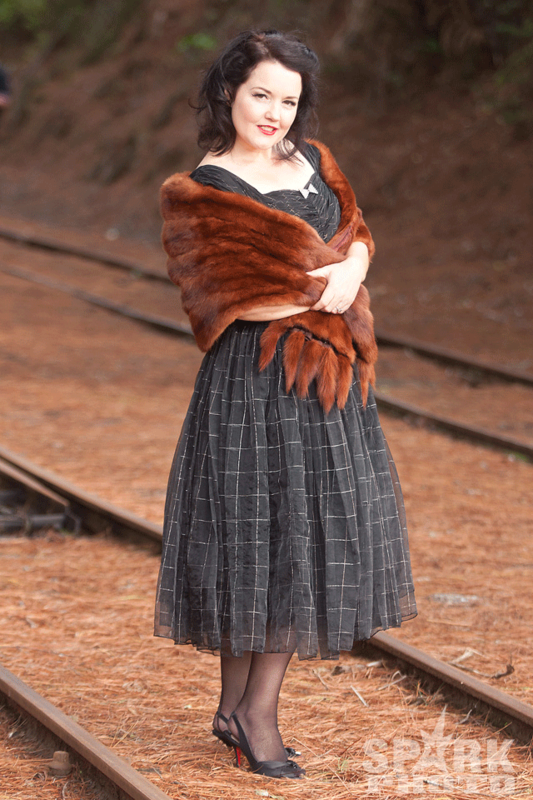 Posted on September 22, 2014 November 25, 2014 by MumptyStylePosted in Burlesque/Pinup, FashionTagged 50's style, 80's reproduction, Classics Museum calendar, David Rowe Photography, fashion, frock, louboutin, mumptystyle, Pukemiro, The Ava, Tiffany Curtis Photography.